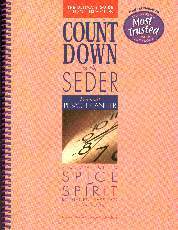 Countdown to the Seder: Personal Pesach Planner, is an easy-to-follow guide to preparing ourselves, our homes and our families for a rich, authentic Seder celebration. Know what to do every step of the way in your Pesach preparation  replete with 25 charts, from Kitchen Inventory List to Alphabetical Cleaning Guide and Seder Food Measurements. Benefit from advice and tips collected from generations of women, presented in six easy steps to ensure that your entire family and guests will sit down to a successful Seder. Soft cover, spiral binding.